Houston businessman Alfred Glassell, Jr. was a well-known philanthropist, but many never knew of his devotion to large species of game fish – not only sport but also for research and conservation. This exhibit highlightsTumbesian fish species including the world record black marlin caught by Glassell on 4 August 1953 that tipped the scales at 1560 pounds. Footage of the catch was used in the 1958 film The Old Man and the Sea, starring Spencer Tracy. 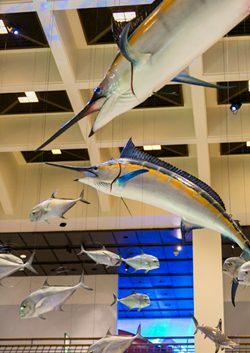 The exhibit includes over 40 specimens of game fish representing over a dozen species found off the coast of Cabo Blanco, Peru, where Glassell landed the big marlin. Media interactives and labels also complement the hall.